Panicked by the thought of trying to re-create your favorite sandwich at home? It happens to the best of us. Luckily it’s actually super easy to make a Vietnamese banh mi sandwich at home. With a couple of substitutes and shortcuts where needed, you’ll be chowing down on your favorite sub in no time. A typical Vietnamese banh mi is served on a small baguette. But unlike the French baguettes you can get at the store, Vietnamese baguettes are usually made with a mixture of wheat and rice flour. The rice flour keeps the baguette light and airy, unlike the chewy French baguettes you might be used to. That means if you don’t live near a Vietnamese bakery or feel like stretching your baking muscles to make your own baguettes, you may need a substitute. Lightly toasted Mexican bolillo or telera rolls will work, or even a toasted sub sandwich roll or kaiser roll will do in a pinch. But if you can’t find those either, then go with an ordinary small baguette. It’s close enough. 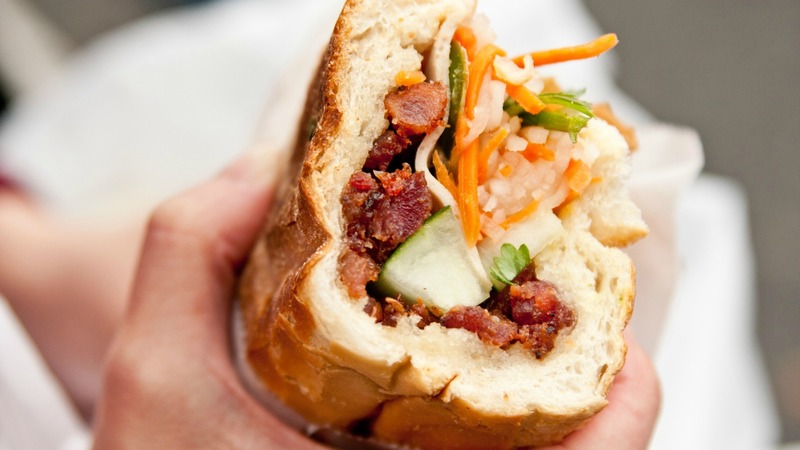 Pork is the most popular banh mi filling, from pork roll to headcheese. At home, you can opt for a thin slice or two of deli ham, thinly sliced leftover pork chops or pork roast, shredded pork shoulder or pork belly or ground pork meatballs, sliced. You can also go with grilled chicken, shredded rotisserie chicken (dark meat preferably) or thinly sliced leftover steak. And note that in a banh mi, the ratio of meat to veggies is usually 1-to-1, so don’t go overboard. Pickles add tart crunch to your banh mi. Luckily you can make Vietnamese pickles from carrots and daikon quickly, subbing regular red radishes or even turnips for the daikon if it’s not available in your area. Chicken or duck liver pâté is a common ingredient in banh mi, spread on the sandwich bread. You can usually find inexpensive pâté at the grocery store, so don’t worry about making it from scratch. And since it’s going in a sandwich alongside other strong flavors, you don’t have to worry if it’s not primo-quality pâté that you would serve with crackers at a fancy party. Squeamish about liver? You can try making a lentil pâté instead. Mayo (or mayo and butter), cilantro, cucumber slices and sliced jalapeños (pickled aren’t traditional, but they will have a milder heat profile) round out the rest of the sandwich. You can splash a dash of Maggi seasoning or soy sauce, a sprinkle of salt or a squirt of Sriracha sauce on the banh mi to finish seasoning, then get ready to chow down. See? That wasn’t so hard after all.